Dayna Berkowitz is an attorney who represents insurance companies. She manages cases to ensure her clients are well informed, especially in matters where insurance companies have been brought into divorce or probate actions. She also has experience with asbestos and birth injury litigation. Dayna is a LexisNexis Certified Researcher and is experienced in all stages of the litigation process, including researching complex and novel issues, drafting motions, and conducting discovery. Prior to joining Hinshaw, Dayna was a summer associate with the firm. 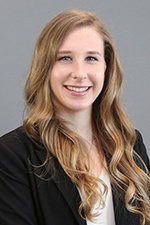 During law school, she gained further experience working as a law clerk for a Dallas based midsized complex litigation firm in Los Angeles and working as a legal extern for a Los Angeles based personal injury and criminal defense firm. In addition to her other academic accomplishments, Dayna was named a Gary Paul Scholar. Dayna was also a member of both the Women's Law Association and the Jewish Law Students Association. When she's not practicing law, Dayna enjoys professional basketball (go Lakers! ), indulging in reality television and exploring the wonderful food Los Angeles has to offer.